How does Spectra’s northern cold snap excuse for fracked gas apply to Florida, the target for the Sabal Trail, Hillabee, and Florida Southeast Connection methane pipelines? And if Spectra CEO Greg Ebel gets his wish to export gas, which T. Boone Pickens already explained will drive up domestic prices, how will higher gas prices help northern cities? Maybe Spectra’s pipelines aren’t for warming up cold houses; maybe they’re for corporate profit at the expense of landowners, taxpayers, ratepayers, and all those “natural” gas bus riders who will be surprised when their fares go up. Maybe we should stop the Sabal Trail pipeline and see if the fracking house of cards falls apart. There’s plenty of natural gas in the ground, everyone seems to agree. But the harsh weather this winter shows there are obstacles to producing it, and more pipelines have to be built. The bitter temperatures boosted demand for natural gas to heat homes and businesses. But wells in some places literally froze, making it difficult for some drillers to keep gas flowing. And the high demand clogged pipelines, so even when there was enough production, the gas couldn’t get where it needed to go. Shortages cropped up, and prices in some places soared to record levels. Californians and Texans were asked to reduce their power consumption because utilities were running low on gas to run power plants. Montana State University in Billings had to cancel classes for a day because of a natural gas shortage. Prices in New England briefly spiked to record levels. Californians were asked to reduce their power consumption because utilities were running low on gas to run power plants. If the problem is cold weather in the north, why does Spectra want to build a pipeline to sunny Florida? Here’s PDF of a reader for county commissions and others who need to get up to speed on the pipeline. Feel free to add local material for your county commission or city council. This victory for landowners against eminent domain by an out-of-state company for the Keystone XL oil pipeline is relevant to the Sabal Trail methane pipeline, which is just as big a boondoggle for remote companies at the expense of local landowners and taxpayers. A Nebraska judge ruled Wednesday the law allowing the controversial Keystone XL oil pipeline to be built across the state is unconstitutional, a move that could further delay the project. Lancaster County District Court Judge Stephanie Stacy sided with three landowners who argued Nebraska’s governor shouldn’t be able to sign off on the pipeline’s route. The governor, Republican Dave Heineman, was handed that power in a law the state Legislature hastily passed in 2012. But the court ruled that under the state’s constitution, only Nebraska’s Public Service Commission could approve such a pipeline route. The judge ruled the Legislature overstepped its bounds and the governor’s approval “must be declared null and void,” because it was based on an unconstitutional law. Nebraska Attorney General Jon Bruning, who defended the law in court, said he would appeal the decision. Georgia’s Public Service Commission hasn’t approved any route for Spectra’s Sabal Trail methane pipeline, and I don’t think Alabama’s has, either. 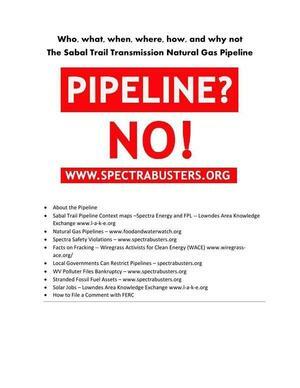 The proposal to build a natural gas pipeline by Sabal Trail/Spectra Energy is unnecessary and, undoubtedly, not in the best interest of the citizens living along its path. Not only will the construction of this pipeline create safety issues and devalue the property of affected landowners, it also serves as an extension of the fracking industry responsible for contaminated groundwater in drilling areas. The externalized costs of the natural gas industry are far too detrimental to public health for this to be considered when the potential for solar power in our region remains largely untapped. Just as natural gas has beaten coal in less than five years, solar power is already beating gas, so betting on LNG exports or even fracked methane for domestic power is a bad investment. These are some implications of a new Citi GPS report. 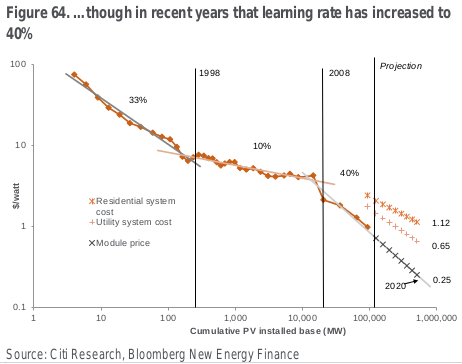 …moreover, solar steals the most valuable part of electricity generation at the peak of the day when prices are highest. This effect has already caused the German utilities to release profit warnings, with some gas power plants in Germany running for less than 10 days in 2012, all of which makes some utilities reluctant to build new gas plants given fears over long term utilisation rates and hence returns. This is not a ‘tomorrow’ story, as we are already seeing utilities altering investment plans, even in the shale-driven U.S., with examples of utilities switching plans for peak-shaving gas plants, and installing solar farms in their stead. Wind is already overshadowing coal in the second quartile. While wind’s intermittency is an issue, with more widespread national adoption it begins to exhibit more baseload characteristics (i.e. it runs more continuously on an aggregated basis). Hence it becomes a viable option, without the risk of low utilisation rates in developed markets, commodity price risk or associated cost of carbon risks.